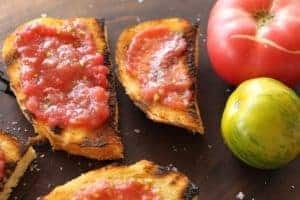 Grilled Tomato Bread is bruschetta. 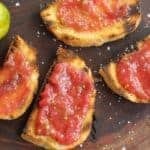 Rub garlic on grilled bread, sprinkle with salt, spread with tomato. The easiest tomato recipe ever! Tasteless, hard, pithy, off color, fewer foods have been maligned as the store-bought tomato. Conversely, fewer foods have been celebrated as the home grown. Summer gardeners to the rescue! This is the time of year to enjoy the juiciness of a ripe tomato. You’ll enjoy them more at room temperature. Refrigeration reduces their flavor and aroma components, so store tomatoes above 50 degrees. Tomatoes were thought to be poisonous until the nineteenth century. We got over that because today we eat them in amounts second only to the potato. On average, we eat more canned tomatoes than fresh. This could be because our season for fresh is so short. More likely it’s because tomatoes = pizza sauce. Pizza lovers contributes to this second place consumption rate. Red tomatoes have more lycopene and overall better-for-you plant compounds than yellow or green tomatoes. 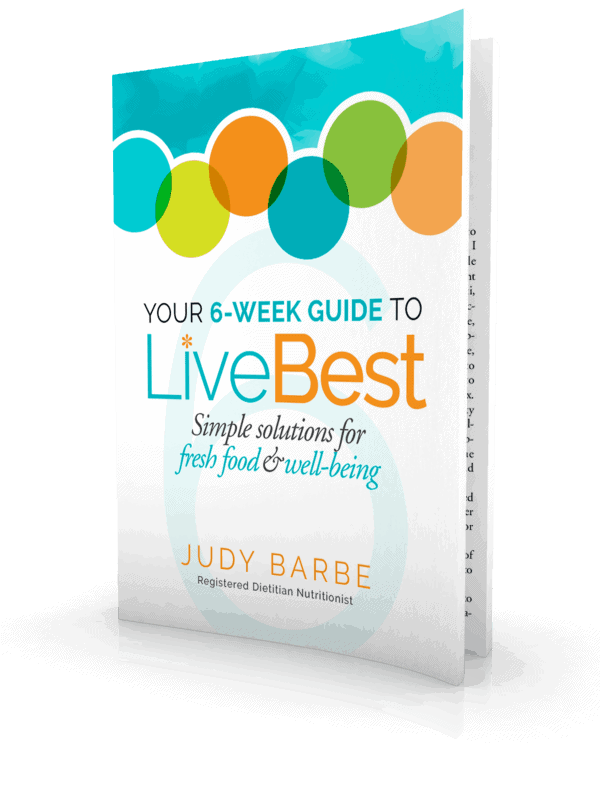 Smaller tomatoes, such as cherry and grape, have more lycopene than larger tomatoes. Canned tomatoes, including tomato paste and sauce, are some of the richest sources of lycopene because cooking increases lycopene and makes it easier to be absorbed. Oil helps your body absorb the tomato’s potent antioxidants and olive oil appears to have an edge over other oils. Synonymous with Italian cuisine, the tomato is actually indigenous to the Andes. 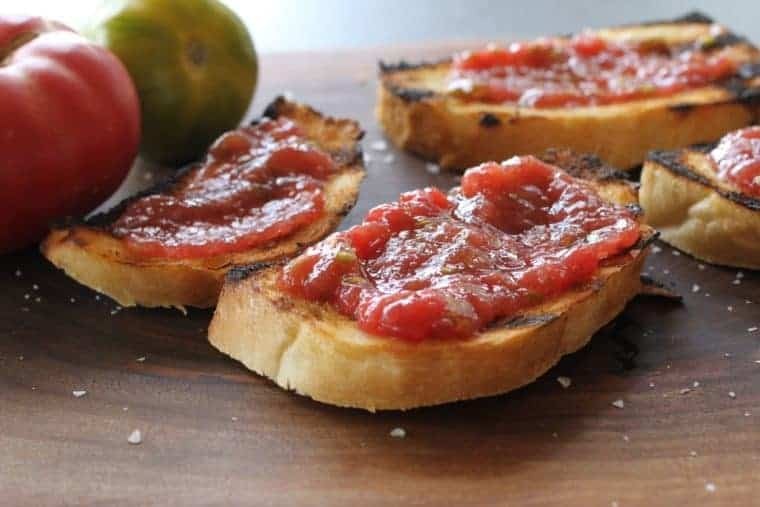 I give a nod to Spain with this grilled tomato bread recipe. Often served as tapas, this bruschetta is an easy way to share simple summer foods. 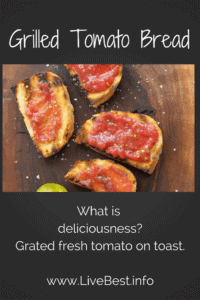 In a nutshell, this recipe is smashed tomato on toast. But it tastes like much more! Rub garlic on grilled bread, sprinkle with salt, spread with tomato. Done! At my house, these disappear as fast as I can make them. You can give each person there own tomato to rub on toast. But if you want to be neat, grate the tomato over the coarse holes of a grater into a bowl. Set the bowl on the table so diners can dress their own toast. In a nutshell, Grilled Tomato Bread is smashed tomato on toast. But it tastes like much more! Rub garlic on grilled bread, sprinkle with salt, spread with tomato. Done! At my house, these disappear as fast as I can make them. Cut bread into individual slices, about 1/2-inch thick. Brush one side with olive oil. Grill bread over medium heat, or broil, to toast. Don’t overdo the toasting, you still want the bread to remain chewy. Depending on heat, this may be 2-4 minutes. Remove bread and rub garlic clove over toasted side of bread. Flesh-side down, rub tomato half* over bread allowing tomato to break up over the bread. Sprinkle with salt. Serve. *Note: Rather than rubbing the tomato over the bread, you may grate the tomato with the coarse side of a box grater. Trim the top of the tomato. Place the grater over a bowl. Grate tomato over the largest holes until you reach the skin.